A visit in Boston is a rewarding experience for those interested in art. Besides larger institutions, such as Institute of Contemporary Art, and the Museum of Fine Art, the gallery world offers a few distinct approaches worthy of a closer look. 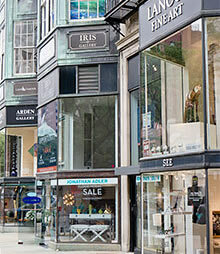 Newbury Street in the Back Bay area attracts many with its shopping, nightlife, and a plethora of art galleries. Pucker Gallery specializes in ceramic art. On the bottom floor, vessels by Brother Thomas of Vermont is on show together with local photographer Paul Caponigro's black and white work. 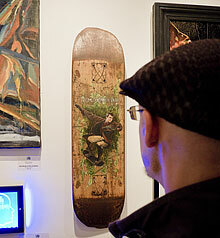 The two men's art work well together, as they share the same meditative aura. The simultaniously strict and soft shapes of the ceramic vessels directly reflect the grayscale and composition of the landscapes and architecture in the photographs. Both men also have the inspiration from Japan in common. The display itself is somewhat messy, and the photographs, moderate in size, cannot match the massive vessels. The gallery shows on five floors, which is far from obvious as the upper floors are reached by elevator, in the company of a guide. 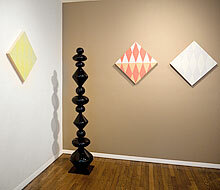 Arden Gallery shows Joanne Mattera's encaustic work Chromatic Geometries.The work is based on geometry and shapes, and she calls her style a ”lush minimalism”. Here, nothing of conceptualism is to be found, but shapes and color are allowed to be self-sufficient, in ways related to the exhibition at Pucker. The technique – pigment dissolved in wax, and applied on the surface when hot – has quickly become widespread, with Mattera as one of the prominent practitioners. In her seventh solo show at Arden, the geometric base is the stylized shape of a cut diamond. Generally, the galleries on Newbury Street share an aura of conservatism, and it seems clear that the role as art dealers is prioritized over innovative exhibitions. A more cooperative and artist run art world is to be found in SoWa (South of Washington Street). 450 Harrison Avenue is an address shared by many art galleries, design boutiques, and art studios. Some of the more contemporary-oriented galleries from Newbury Street have moved here. The first Friday of each month, most galleries in the block hold their openings, and the art studios are open to visitors. The Boston scholar Lewis Hyde's influential book The Gift is the intellectual base of the show Gifted at Kingston Gallery. 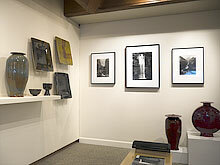 All members of the gallery co-op show work in several different media. Hyde discusses the gift based and cooperative parallel economy of the art world within the capitalist world. The exhibition deals with several anthropological and societal issues. Ilona Anderson, who left Apartheid era South Africa for Boston, and with a religious background in Judaism and Buddhism, often deals with issues of origin, religion, and identity. Her piece What One Is, is no exception. 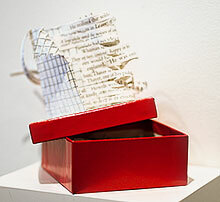 Celine Browning works with relations between object and symbol, and between function, dysfunction and re-function. Something of Ours is a sculptural piece made out of clothes, with only the outlines left, symbolically suggesting the original function. In Gallery Kayafas, photographer Bruce Myren walks through the door to see his exhibition The Fortieth Parallel installed for the first time after fourteen years of work. The crowdfunded show consists of 50 panoramas from the fortieth parallel in the United States. Each panorama is made out of three 8x10" color photographs mounted side by side. The work is conceptual with a self-imposed set of rules. A GPS device decides the exact position of where the photographs are made. Except for the two coastlines, all of them are made precisely where longitudal degrees cross the parallel. With his core samples of the American landscape, Myren tells a story of a surprisingly empty continent. Even more oriented towards cooperation and creative exchange, is the neighborhood of Centre and South Street in Jamaica Plain. Galleries blend in with residential buildings, small shops and restaurants. 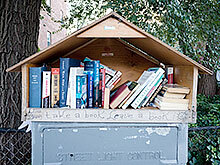 Folk music can be heard from stoops, and on top of a traffic light control, a miniature library is to be found. The Aviary is a combined exhibition space, design boutique, and printshop. Sarah Coyne's Great Distance, watercolor paintings of migrating animals,is on show for the month of September. 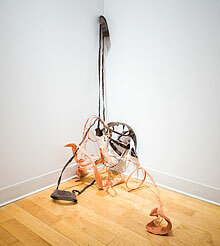 With perpetual repetition of the theme, she depicts migration as the natural condition of life. 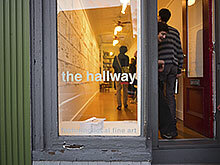 A few steps down the street, we find The Hallway, a gallery focusing on emerging, local artists, and located in a very narrow room, physically forcing the viewer close to the art. The shows change frequently. Trouble is an exhibition and book consisting of 184 black and white drawings by Tim McCool. 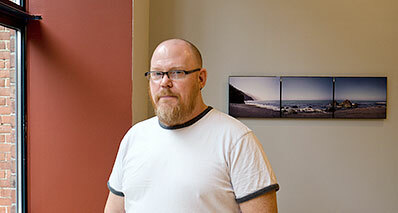 Uforge on Centre Street specializes in open, unjuried exhibitions. Consequently, media, expressions, and quality varies. The Truth Is Out There is a show on a science fiction theme. It is a young crowd of artists, most of them living not very far from Boston. The first Thursday of each month is when Jamaica Plain keeps open houses.